Hur, J.W., Cullen, T. & Brush, T. (2010). Teaching for Application: A Model for Assisting Pre-Service Teachers With Technology Integration. 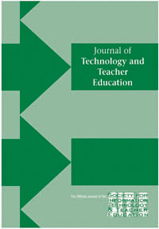 Journal of Technology and Teacher Education, 18 (1), 161-182. Waynesville, NC USA: Society for Information Technology & Teacher Education. Retrieved April 23, 2019 from https://www.learntechlib.org/primary/p/29461/.